Canning is such a satisfying thing to do. Seeing rows and rows of beautifully colored jars filled with things you've grown yourself fills one with a wonderful sense of pride. The fulfillment you get from seeing your full larder shelves is only surpassed by the luxury of opening those jars on a cold winter day and serving up some summer. Canning is becoming more popular nowadays. Once people find out about my countrified upbringing, they ask me about it regularly. As a matter of fact, I’ve taught classes on this at the Natural Gardener and the 2014 Suburban Dad Survivalist Preparedness Conference, among other places. Since so many people ask me about this, I thought it'd make a good subject for the blog, so thought I'd post my class outline/handout here. If you want to print this off (six pages, depending on your margin settings), here's the link. And if you want to print off a much shortened, paper-saver version (two pages), here's that link. All this class preparation has me realizing just how little I've canned lately. I miss the secure feeling that having all those jars of jelly and pickles sitting on the shelves gives me. And I really miss looking at them: the deep burgundy of the Mustang grape jelly, bright red pickled beets, gorgeous green of dilly beans, and bright yellow sweet corn that's really better frozen but is just too pretty to not can a little. Man, I miss having a food rainbow in my pantry to hold me over in winter until the colors of spring return. Really, it's that satisfying to just see them sitting there. As soon as you get something canned you'll see what I mean. You'll find yourself periodically going back to the kitchen just to look at what you made. You'll stack them one way, then arrange them according to color, then re-rearrange them according to something else. Even after the new wears off, you'll still occasionally open the cabinet doors just to take a peek. And every time you'll smile knowing it'll be a long time before you'll have to deal with an empty belly. I think while y'all are reading this, I'm going to go pull out the canners, dig out the jars, and can something. To carry your food production efforts full circle and save every bit of those vegetables you worked so hard to grow. To save money while eating better: buy in bulk fresh from the farm, catch things on sale, and be able to preserve them for a time when they’re not so plentiful. 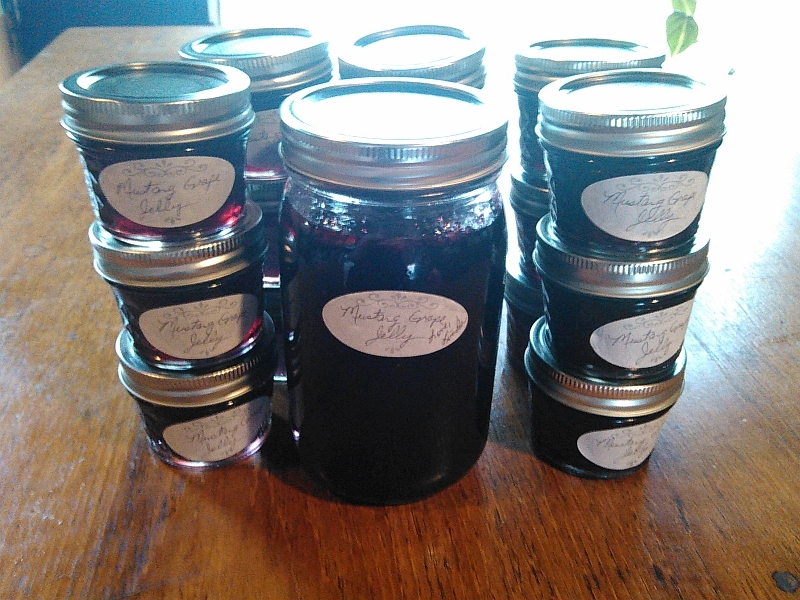 To make and save things not available in stores, like Mustang grape jelly. To have the peace of mind of knowing you can take care of yourself no matter what happens. If a storm knocks out the power or you lose your job, you’ll still be able to eat well. To stay in touch with our grandparents. To live history. To brag to your friends. Canning is not cooking - Canning is a science: the science of preserving food without refrigeration by killing food-borne toxins and keeping them from later growing. Think of it this way: you preserve food items using scientific principles, then use those food items in your cooking later. You don’t make a peach cobbler and can it, you can the peaches and use those to make the cobbler later. You don’t find canned peach cobbler on the grocery shelf next to the canned peaches - that cobbler’s over in the frozen food aisle. There’s good reason for that: cobbler and many other fully-made dishes can’t be canned safely. And even if you can can them safely (See what I did there? *snicker*), the end result is often a cooked-to-death mush that tastes just awful. Heating to 212 degrees kills most all toxins except botulinum spores, a “dormant” form of the botulinum bacteria. Higher heat is needed to kill them. Adding pressure increases temperature, so to kill the botulinum spores, pressure canning is needed to reach those temperatures. BUT acidity keeps those spores dormant, keeps them from turning back into the botulism-causing bacteria. Therefore, high acid foods that are below 4.6 on the pH scale AND stay there over time are safe when water-bath canned at 212 degrees since the acidity will keep the spores from growing. ~ A couple notes of caution: Some things can be below 4.6 acidity at the time you can them, but will rise over time. For instance, a jar of whole pickles may be below 4.6 at canning time, but later, as the moisture from inside the cucumbers comes out into the brine, it can raise the pH to higher than 4.6, leading to possible growth of botulism. This is why it’s important to use a tested recipe from a reliable source since it has been tested over the course of time in storage and is known to stay below 4.6. ~ This is also why vinegar with the correct acidity percentage is important! All vinegars are NOT the same. Read the label carefully. Any food that is over 4.6 on the pH scale must be pressure canned. Water-bath canning = heating sealed jars of food in boiling (212 degrees) water for a specified time. Pressure canning = heating sealed jars of food under pressure which raises temperatures well above boiling (212 degrees). Of the two types of canning, I’ll be focusing on water-bath canning, which is the method used to preserve high-acid foods like jams, jellies, preserves, pickles, and some tomatoes. Both types of canning are almost exactly the same up to the point of the actual processing (putting full jars in the appropriate canners and processing/“cooking”), but pressure canning is a good bit more involved from that point on and requires more expensive equipment (the pressure canner). Plus, there’s less margin for error with pressure canning (it’s easier to poison yourself if you screw up), so it’s good to practice on jellies and pickles before moving up to full-blown pressure canning. So we’ll just start with water-bath canning. Some things, such as breads, just aren’t safe to can. Use only tested recipes and procedures (again, ones that have been pH tested over the course of a year). All the recipes and procedures in the Ball Blue Book and at the National Center for Home Food Preservation website (see links below) have been tested. Be sure to process for the recommended time, adjusting for altitude if needed. About altitude: The State Capitol building in Austin is 545 feet above sea level, so most of us who live in the Central Texas area don’t have to worry about it. But it’s important to know that altitude affects pressure and therefore temperature during cooking, mainly allowing water to boil at lower temperatures, so adjustments are needed if canning in a high-altitude area. If you live on top of a hill, double-check your sea level via the links at bottom to info on finding your altitude and how to adjust for it. A good reference that contains tested how-to instructions and tested recipes. - See links below for this information online, or buy the Ball Blue Book. Large pot with lid and rack - The pot must be large enough to hold jars along with enough water to cover them. A lid helps hold in heat and keep the water from evaporating so you don’t have to add more in mid-process, thus bringing down the temp and having to start your timing over again. The rack can be anything that can take the heat, such as cake cooling rack or collapsible vegetable steamer, that fits in your pot to hold the jars upright and off the bottom ¼ inch or more during processing. Canning jars - Only use jars made and sold for canning. Other jars, such as mayonnaise jars, aren’t necessarily tested to withstand boiling water baths (commercial processors use some preservatives and other preservation methods that don’t always involve high heat and aren’t available to the home canner). Even if they’re new, be sure to check your jars for cracks and nicks every time you do another round of canning, especially around the rim. Discard any damaged ones that you find, or use them for drinking glasses. Rings and NEW lids - Rings can be re-used if still in good condition, but, unless you use the reusable lids like the Tattler lids, BRAND NEW lids must be used for a good and safe seal. The rubber that makes the seal on the lid can be damaged easily during use, sometimes in ways you can’t see with your naked eyes, which can prevent a safe seal during canning. Since you’re literally betting your life on this, just use new ones. They’re cheap. Cooking pot - Anything big enough to boil the food you are going to can before putting it in the jars. Tongs for removing jars, rings, and lids from hot water - Special canning tools are recommended for this (see below), but you can use anything that will allow you to safely and firmly grasp and lift hot jars, etc., from hot water. Water for cleaning and/or cooking - The pH of the water isn’t important unless you’re making extremely low-adic things and adding the water to the food. In that case, use distilled water and/or test the pH and add acid if needed (more on pH testing later). Stove or other heat source capable of boiling water - The largest burners of most stoves are enough. Glass-top stoves are not recommended as they don’t work well with large canning pots or pressure canners except flat-bottomed ones, and some glass-topped stoves have an “auto shut off” feature that shuts the heat off when the glass gets to a certain temp. Fluctuating temperatures aren’t good for canning and can lead to inadequate pathogen killing. So, if you have a glass-topped stove, just use that as an excuse to buy yourself a turkey fryer and use that for canning (Bonus: that will allow you to can outside where it’s cooler!). Labeling equipment - A magic marker for writing the date and food name on the lid is fine, but labels applied to the side of jar are easier to see in storage. Even masking tape will work, so long as it stays stuck on the jar. ~ A note about pressure canners: I like the ones with the weighted gauges. Dial gauges can become inaccurate over time, but a big hunk of metal with no moving parts won’t. Also, they're easier to vent air from (when heating canners and bringing them up to pressure, you have to vent any air inside before processing to get even heat throughout), practically doing it themselves. The only negatives I can think of are the weight can be lost easily if you don’t put it inside the canner when not using it, and, as far as I know, you can’t get a precise PSI (it’s either 5, 10, or 15), but those things are easy to live with and outweighed by the positives imho. Ball Blue Book - Good canning information can be found online, but it’s reallly useful to have a hard copy in front of you. This book can usually be found for not much more than the cost of printing the info yourself. Canning jar tongs - These are specially designed tongs that make it easy to remove jars from boiling water. Magnetic lid “lifter” - This is a little “wand” with a magnet on the end for lifting lids and rings from boiling water. Food mill, food processor, tomato mill, etc. - These make slicing, dicing, and juicing SO much easier. Canning jar funnel - A specially shaped and sized funnel that allows for easier filling of jars without getting the rims dirty. Water-bath canner with rack - This large pot and rack are specially designed to hold the maximum number of jars and allow for easy removal of those jars: the “rack” is actually a basket that holds all the jars making them easy to lift out all together. pH testing strips or meter capable of reading a range from 3 to 6 in small increments - (Great advice on how to buy a good meter from Cornell University here and in the links below. Also calibrate it, recalibrate it and calibrate it again, every time you use it.) 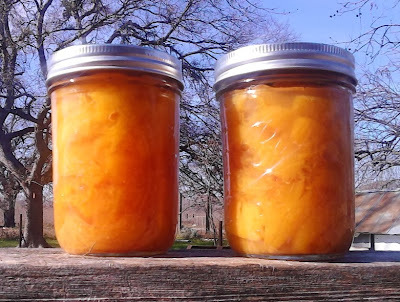 If you follow a tested recipe or are canning very high-acid food such as peaches without anything added, pH testing isn’t needed, but it’s handy to do just to double-check for safety’s sake. If you’re deviating from a tested recipe at all, even simply adding different spices or less sugar, it’s important to make sure your food to be canned is at or below 4.6. Test after cooking the food to be canned, right before putting it in the jars, and only test food at room temp (dip out a few tablespoons, allow to cool, then test). NOTE: Remember that pH can rise in the canned jar over time, so using an untested recipe can still be dangerous even if you test it at canning time and it’s in the correct range. Therefore, again, it’s not recommended to use untested recipes, but if you have to, at least test the pH and make sure it’s well below 4.6 at canning time, test jars from the same batch periodically (every month or so), and test the food again before you eat it. Assemble all cleaned equipment on cleaned kitchen counters (or outside on clean tables if you’re one of the lucky ones with your own turkey fryer). Bring lids, rings, and jars just to a boil in water-bath canning pot, then turn off heat. To avoid lime deposits on jars, add one cup vinegar per gallon of water to pot. Fruits: Preserves are generally whole fruit that can be crushed or sliced. Jams are generally whole fruit that’s been mashed. Jellies are just the juice, usually with added sugar and pectin (the substance found in most fruits that causes jelly to gel). You can add sugar, and it makes for a good preservative in it’s own right, but on very high-acid things like peaches, it’s not imperative. Pickles, no matter if they’re made from cucumbers, watermelon, or something else, need to be canned in vinegar, or a solution made with vinegar, to raise their acidity. Be sure to use pickling vinegar of the exact acidity percentage your recipe calls for. That’s usually 5% in modern recipes, but if using an old recipe, be aware that some pickling vinegars used to be more acidic, so your 5% vinegar may not be strong enough. Also, you should always use a tested recipe when pickling as you’re usually working with low- to no-acid vegetables with a higher pH (for instance, cucumbers can be well over 5 on the pH scale). Calculating the pH of the food, then calculating how much acidity to add to bring that pH down to safe levels, leads to such mental gymnastics that it’s best left to the professionals. Just let them do the work for you (I’m not lazy. I’m efficient.). Raw pack method: Fill jars with raw food, pour boiling-hot canning solution over it. Hot pack method: Bring raw food to boil in canning solution, ladle into jars. If you want to can plain high-acid food without added sugar, you must use the hot-pack method: prepare food as desired (mashing, cutting into smaller pieces, etc.) and add to pot with enough water to get it to boiling, then cover and boil for 2 to 3 minutes, stirring as needed. If canning plain low-acid or borderline things such as tomatoes, add acidity with citric acid or lemon juice, then test the pH to ensure it’s below 4.6. Or just use a tested recipe. A note about tomatoes: Some tomatoes aren’t really as acidic as commonly thought, so need acidity added to make them safe to water-bath can. The most likely culprits are yellow, white, orange, or pink tomatoes, though even some red ones nowadays have been found to have a pH right at or higher than 4.6. San Marzano tomatoes, one of the quintessential canning tomatoes, are one such type. This is where testing the pH yourself really comes in handy. To raise the acidity, you can add citric acid, lemon juice (bottled, since the pH of juice from raw lemons can vary widely) or vinegar. Each one will have a different taste, so experiment to find the one you like best. Remove jars, lids, and rings onto clean kitchen towel laid out on counter. Immediately fill with food to be canned, being careful to avoid getting any on jar rims, leaving at least half an inch of headspace (empty space between top of food and rim of jar). “Bubble” them, ie insert a thin utensil to work out air bubbles. Wipe rims with clean kitchen towel. Working quickly, put lids and rings on jars, not tightening, just applying ‘til snug. The lids and rings are designed to form a one-way valve, allowing pressure that builds up inside the jar to exhaust during processing (also called venting). If you tighten the rings too tight, the jars may break or explode. Venting is also why you leave the half an inch of headspace - so your food doesn’t get pushed out of the jars as they vent, dirtying the rim and possibly getting in the way of a safe seal forming between the lid and the jar rim. Place jars back in water-bath canning pot, making sure water is covering top of jars by at least an inch. If you stack jars, don’t stack directly on top of each other: instead, place one jar “staggered” over two below. Cover pot, bring back to a boil and start timing. Process (boil) for the time recommended by your recipe. If canning whole, high-acid fruits in pint or half-pint jars, process for 20-25 minutes. If canning in altitudes higher than 1000 feet above sea level, consult the link below about adjustments. When time is up, remove the jars from the canner to a towel on the counter. Using towels as hot pads, tighten lids. Let cool slowly, keeping them out of drafts (if they cool too quickly, the jars make break). Smile as you hear the pings of the jars sealing while you’re drinking that well-earned beer to celebrate your first canning success. Next day, test every seal (see below, under “Problems you may encounter”), then label and date all jars and store in a cool, dark place. Jars not “pinging” when sealing - Wait ‘til jars are completely cool (next day is good) and feel the center of the lid. If it’s convex (“caved in/down”), your jar is sealed. I double-check by removing the ring and trying to pick up the jar by the lid; if it holds, I’ve got a good seal. If the jar fails any of these tests, I refrigerate and eat promptly. Lime deposits on jars - Add one cup vinegar per gallon of water to canner pot before boiling jars. Jars breaking - This doesn’t happen often, but it’s usually because the rings were tightened too much before processing or they were exposed to drafts or cold while still hot from the canner. Growing things that need no preservation (winter squash, dried beans, and dried corn that can be simply stored on a shelf - also tuber crops that can be left in the ground and dug as needed). start growing and canning now! The skills of growing your own food and preserving it take practice. Start now so you’ll know how should you ever need to rely on it. Here’s hoping you never will have to. PickYourOwn.org canning how-tos, where to get supplies, etc.